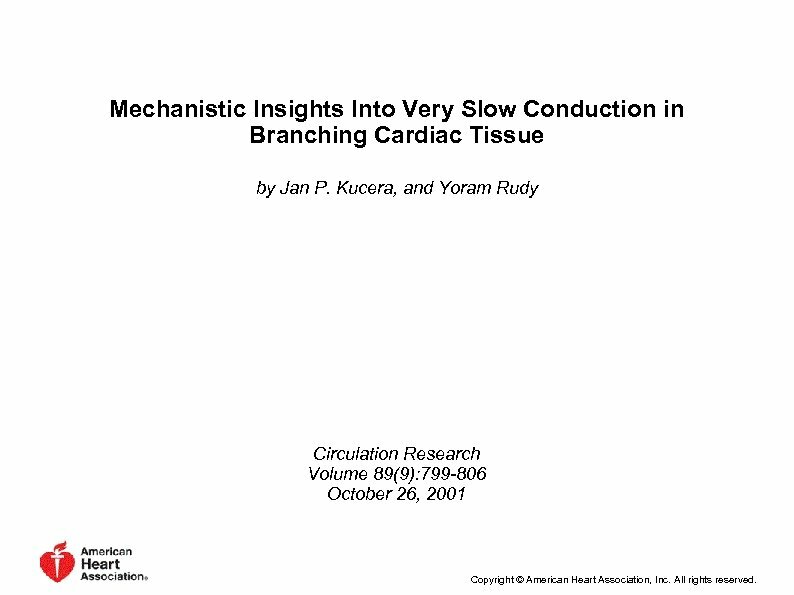 Mechanistic Insights Into Very Slow Conduction in Branching Cardiac Tissue by Jan P. Kucera, and Yoram Rudy Circulation Research Volume 89(9): 799 -806 October 26, 2001 Copyright © American Heart Association, Inc. All rights reserved. Figure 1. 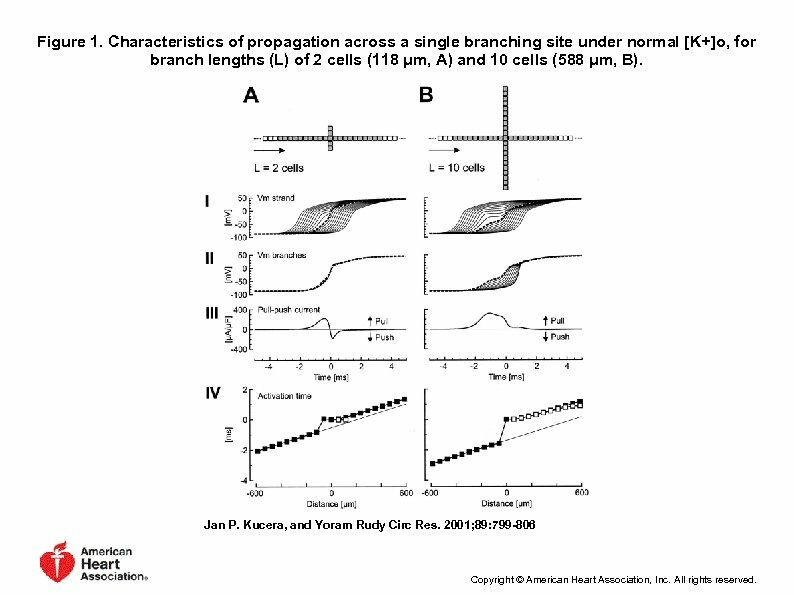 Characteristics of propagation across a single branching site under normal [K+]o, for branch lengths (L) of 2 cells (118 μm, A) and 10 cells (588 μm, B). Jan P. Kucera, and Yoram Rudy Circ Res. 2001; 89: 799 -806 Copyright © American Heart Association, Inc. All rights reserved. Figure 2. 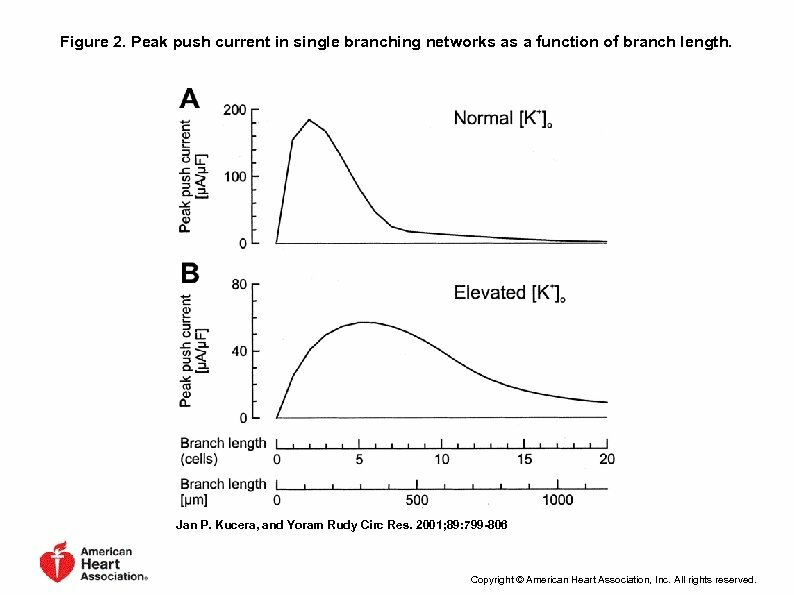 Peak push current in single branching networks as a function of branch length. Jan P. Kucera, and Yoram Rudy Circ Res. 2001; 89: 799 -806 Copyright © American Heart Association, Inc. All rights reserved. Figure 3. 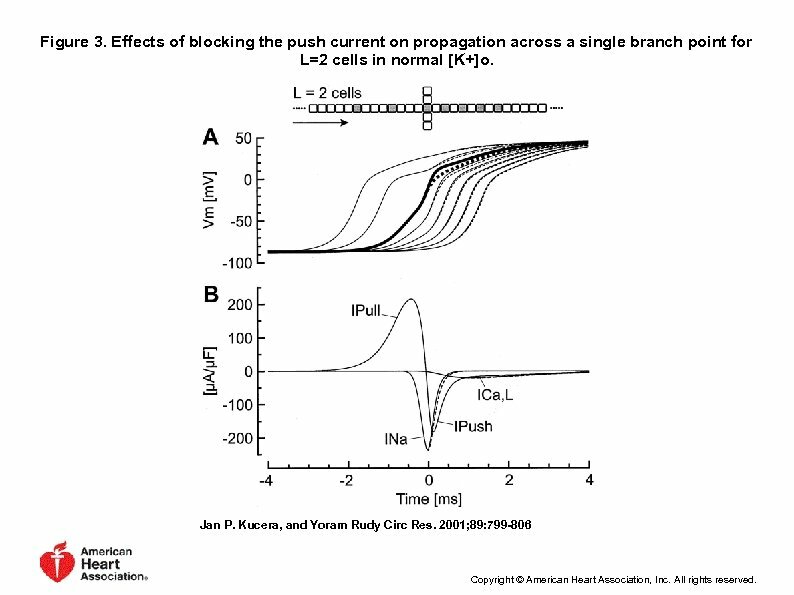 Effects of blocking the push current on propagation across a single branch point for L=2 cells in normal [K+]o. Jan P. Kucera, and Yoram Rudy Circ Res. 2001; 89: 799 -806 Copyright © American Heart Association, Inc. All rights reserved. Figure 4. 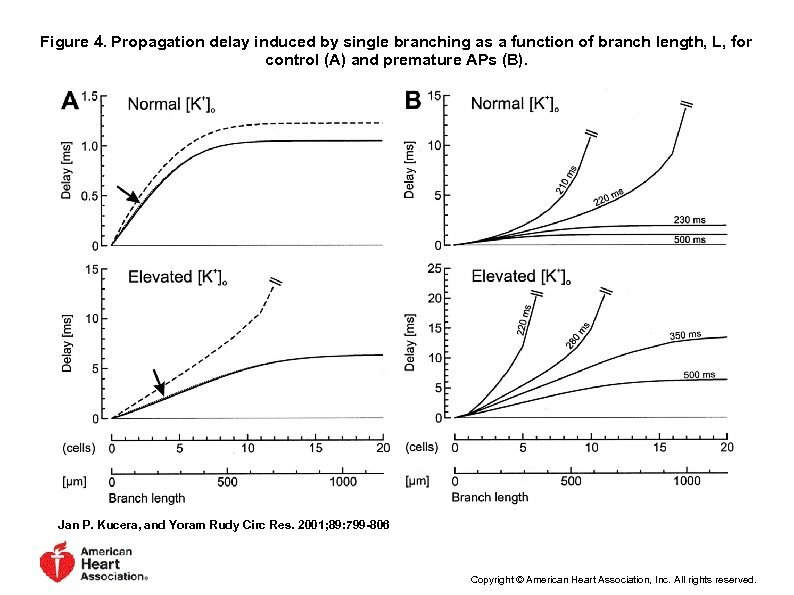 Propagation delay induced by single branching as a function of branch length, L, for control (A) and premature APs (B). Jan P. Kucera, and Yoram Rudy Circ Res. 2001; 89: 799 -806 Copyright © American Heart Association, Inc. All rights reserved. Figure 5. 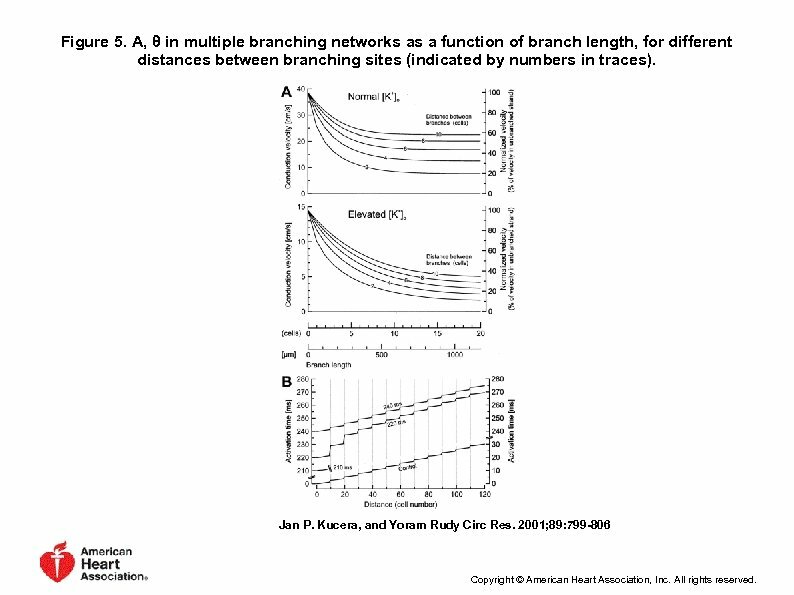 A, θ in multiple branching networks as a function of branch length, for different distances between branching sites (indicated by numbers in traces). Jan P. Kucera, and Yoram Rudy Circ Res. 2001; 89: 799 -806 Copyright © American Heart Association, Inc. All rights reserved. Figure 6. 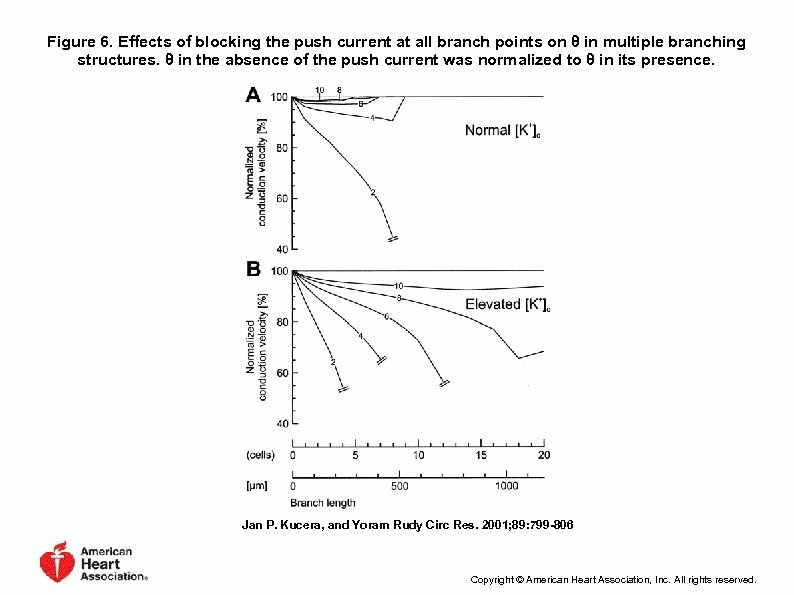 Effects of blocking the push current at all branch points on θ in multiple branching structures. θ in the absence of the push current was normalized to θ in its presence. Jan P. Kucera, and Yoram Rudy Circ Res. 2001; 89: 799 -806 Copyright © American Heart Association, Inc. All rights reserved. Figure 7. 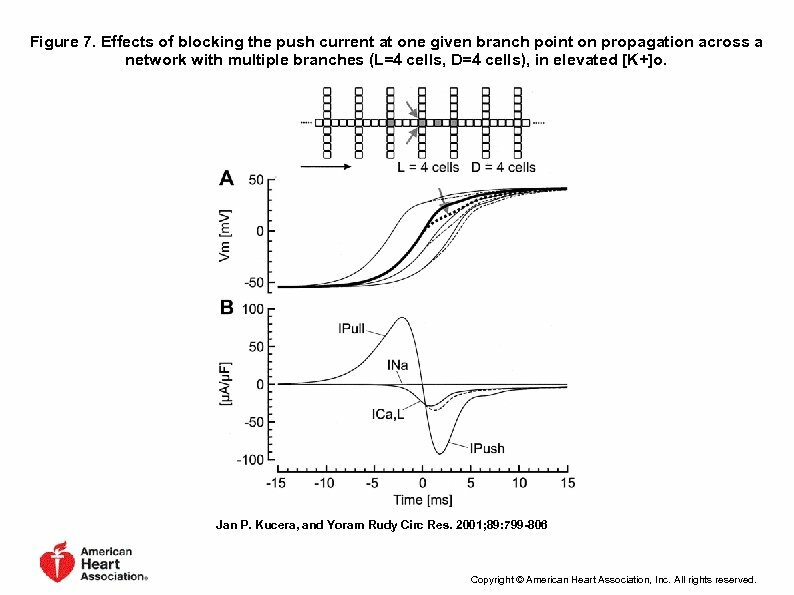 Effects of blocking the push current at one given branch point on propagation across a network with multiple branches (L=4 cells, D=4 cells), in elevated [K+]o. Jan P. Kucera, and Yoram Rudy Circ Res. 2001; 89: 799 -806 Copyright © American Heart Association, Inc. All rights reserved. Figure 8. 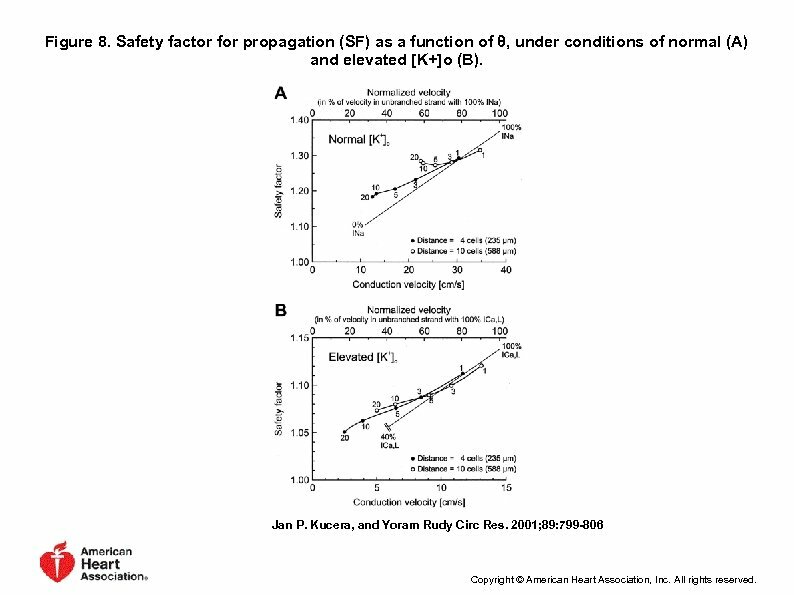 Safety factor for propagation (SF) as a function of θ, under conditions of normal (A) and elevated [K+]o (B). Jan P. Kucera, and Yoram Rudy Circ Res. 2001; 89: 799 -806 Copyright © American Heart Association, Inc. All rights reserved.